Nice heated up with a curry but a but expensive for how much you get. Had to add more garlic and oil to it though. Was not happy with this naan bread. The bread, even after heating, was dry and brittle – not a traditional naan bread which is supposed to be soft and fluffy! I use Mission Naan bread as a Pizza base, adding the toppings as to each personal choice. A quick cook under the grill and it’s done. I love naan bread and this naan bread happens to be my go to naan bread when I am at the supermarket. It is super easy and convenient to heat up and tastes delicious! 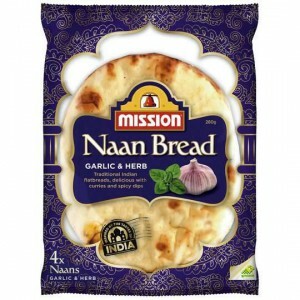 How would you rate Mission Naan Bread Garlic & Hreb?